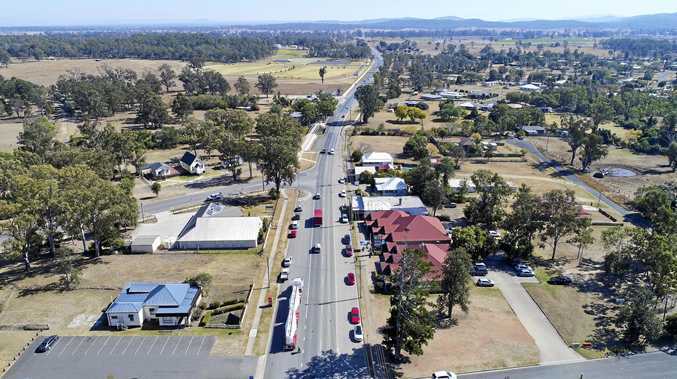 For many Australians, the first port of Canadian call is the west coast with its stunning Rockies and lively cities like Vancouver, but it's also worth heading over to the east to take in the sights. My wife and I recently had an enjoyable time exploring their big four cities of the east - Toronto, Montreal, Quebec City and Ottawa - and can thoroughly recommend them. We chose to take the train for the trip, and it worked out well, although, frankly, some of the scenery was not exactly Rockies class. But the trains were speedy, comfortable and not too expensive. 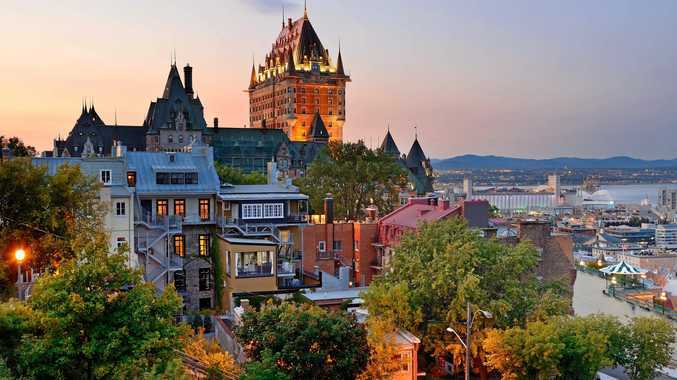 The big four cities are a contrast - from picturesque Quebec City, apart from a few industrial chimneys, the comparatively sedate Ottawa, to the more modern Toronto and a more bohemian Montreal. Unsurprisingly, Quebec City was our favourite, with its old (upper) town, and the adjacent old (lower) town. Boat people (those from luxurious cruisers) were everywhere in those hot spots. Neither "oldie” should be missed, with the lower town next to the boat terminals particularly appealing ... cobbled streets with cute little shops. We stopped for a break in a tiny park just off the main pedestrian drag and simply watched the passing parade. Ditto, around the corner in a small, also cobbled, square, with a seriously decadent ice-cream shop. We took a break to recharge the batteries for the hilly climb to the absolute centre of the tourist action - the old town, particularly the public space in front of what is tagged the world's most photographed hotel, the Chateau Frontenac. Crowds milled nearby to watch the street artists. Other tourists ventured into nearby streets to soak up the atmosphere. The area in front of the Frontenac affords a superb viewing spot, high above the St Lawrence River. Venture a little further on foot to take in the restaurant area along the colourful Rue St Daphne. We stumbled on this area just minutes after arriving at our apartment, which was up the road. The street was heaving early in the evening with visitors and locals looking for a bite to eat. It didn't take long to find a good Italian ... restaurant, that is. The old part of Quebec City is compact and therefore easily walked, but be warned, there are hills. We stayed close by, in the old town, in a pleasant little apartment with high ceilings, big windows but a strange dungeon-like kitchen. 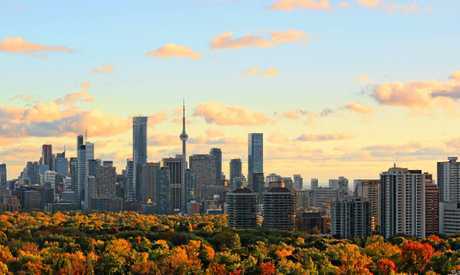 If you're searching for big-city action, then either Toronto or Montreal should do your business. Toronto is mostly modern, with wide, flat downtown streets. It looked clean as a whistle. The big attraction is the imposing 553m CN tower but, frankly, it was just like looking out over any other large metropolis. Granted, the restaurant at the top serves up a pretty decent view and an over-the-top parfait if you, like my wife, decide to seriously indulge. Don't miss the bohemian Kensington Market, near downtown - a collection of colourful shops ... quite a contrast in an otherwise seemingly slick, modern metropolis. Here you can try a cholesterol-raising plate of chips, cheese curds and gravy called poutine, for $11. We tried it once. Once was enough. The other market worth a look-see was the more mainstream St Lawrence, whose big attraction was the substantial peameal (cured) bacon burger from the Paddington's Pump stall. Again, when in Rome, so we shared one. Not bad. Just don't have a blood test any time soon. For a change of pace, jump on a city ferry for the 13-minute trip to the Toronto Islands to check out the parks, beaches (not great), good boardwalks and couple of lovely little cafes, with my wife again indulging, this time a chocolate torte. Well, we are on holiday. So, on to Montreal and first impressions, from the train, were not great but things looked up soon after. 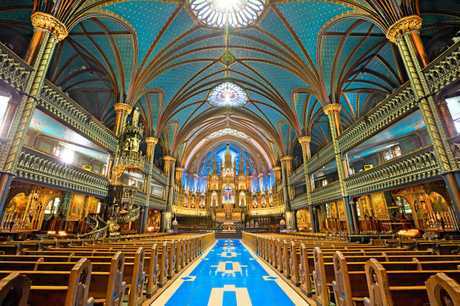 An absolute must-see downtown is the amazing Notre-Dame Basilica, with the brightest of blue interiors. I've seen a few cathedrals in my time but nothing like this one. Subdued it is not. Its exterior is like many others, but once inside, your jaw will drop. Also, do not miss a visit to the lungs of the city, Mount Royal (from which the city got its name), a massive green area boasting an impressive mix of walking trails, parks and, at the Mount top itself, a lookout with a lovely old building in which to take a breather if you're as stupid/keen as us and have taken the hilly shortcut up a gasping 339 steps. We staggered to the top, after a few mini-breaks and were regularly passed by super-lycra- clad-humans not even puffing. Once there, the view on a hazy day was a bit of a disappointment. I suppose you can't have an Eiffel Tower or Opera House to gaze at in every big city, but to me it looked more of the Toronto Tower-lookout same. Still, there were lovely green spaces nearby and even a lake. We stayed nearby in a claimed bohemian/student area, which combined appealing, quirky eateries, a few pleasant little green spaces and some shabby residential and retail areas. Walking into the downtown one afternoon through one of those "well-worn areas”, we came across a little nightspot called Club Soda. Canadian singer-songwriter Bruce Cockburn was performing there that night. So, two tickets later (at a reasonable $50 each) we returned, bought a beer, headed upstairs for a front-row seat and table and enjoyed the show. So, keep an eye out for these little gems that can appear unexpectedly in the biggish cities. For something more sedate, head to the national capital Ottawa, which initially I wasn't keen on, thinking it might be a bit boring. I was correct about one of its attractions - a slow, relaxing cruise along the city reaches of its 200km Rideau Canal - but was pleasantly surprised by others, most notably a guided tour of their impressive national parliament buildings. These gothic-style buildings, with some cathedral-like interiors, are the most impressive structures in town. You have to book early at the office across the road to get a free tour. The tip here is to arrive early for the best chance as places are limited for the top free show in town. There were 50 in the queue one morning. If you're there for the national day on July 1, you'll see quite a fireworks display. A short walk away is the other must-see - the colourful ByWard Market, with you've guessed it, more food. This time, it was a BeaverTails pastry for $4.95 which filled a hole. Can't see why some people rave about them. Again, people-watching was the go with an interesting cross section of locals and visitors. Adding a touch of class to proceedings was an elegant young Asian woman plying her musical wares. Also nearby is Ottawa's Notre-Dame Cathedral Basilica with its shiny silver spires. It's also well worth a peek inside to see yet another stunning interior. Sadly, they don't make 'em like that anymore.